Cold, cold , and cold again. Brain numbed by a disturbed night’s sleep, each 15 minutes punctuated by the chiming of the bells, reminding you that it’s cold. A mind blurred, and thinking fuzzy, and weak, from tiredness, from lack of sleep – proper, calm, quiet sleep – that we all need to survive. The ground is damp, the bench too narrow, the people too noisy, the area not safe – where to go, where to “relax”. And this was just one night out for the team from Project Touchdown. 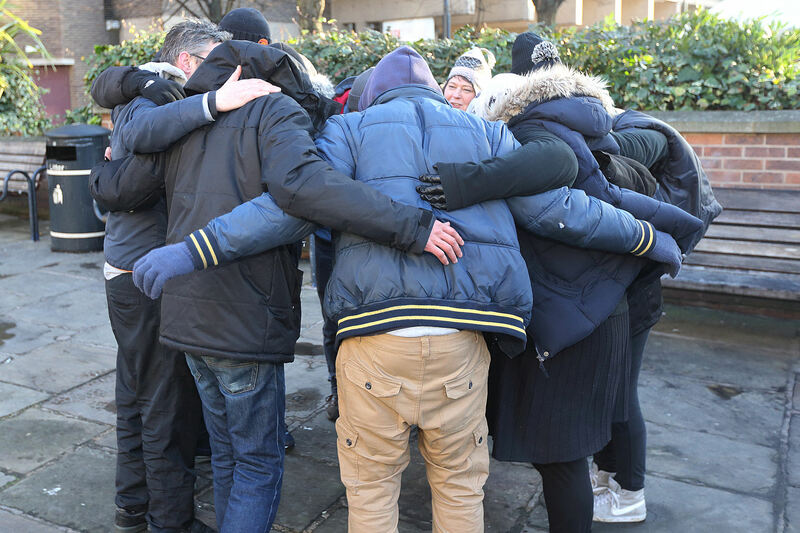 They wanted to experience for themselves what it means to be on the street, to have some sense of solidarity with the people that they feed every Thursday, to feel, personally, some of the struggle of living outside….and perhaps, they can help their service users better? When I spoke to some of them, last night, everyone seemed bright, and ready for the challenge – after all, it’s only one night. I left them at 9pm, I was getting cold, and I promised to return at 7am to take a photograph of the team. 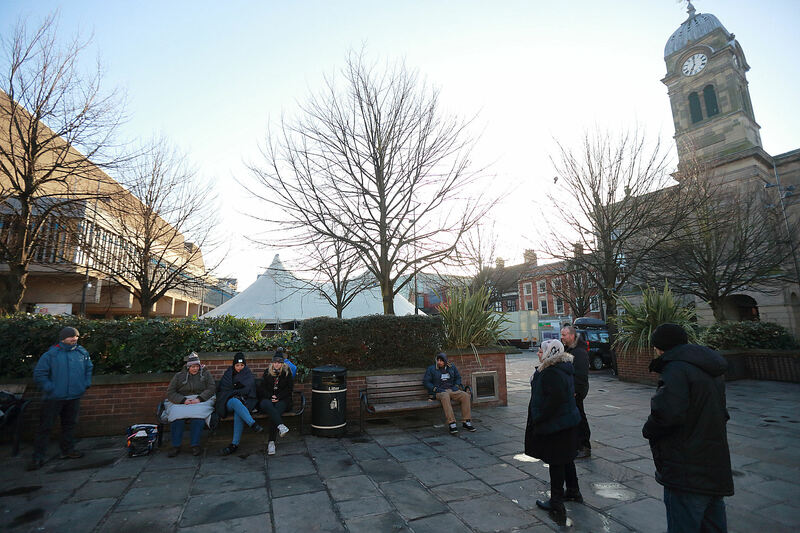 As I returned to the Market Square, just by the fountain, the atmosphere was mixed – some tried to keep the mood high, and for some, it was the “thousand yard stare”. They told the tales of walking through the town, looking for suitable places, to the railway station, back into the Centre by the Silk mill, near the Assembly rooms, and then returning to the Fountain. Trying to find a comfortable place that wasn’t so cold, that was away from the noisy drunken revellers, that was safe. This was not just a night out for them, it was an experience. For me it had been a few hours in bed, for them it must have felt like a week – and my impression was that it had changed them – they’d had a glimpse of an urban nightmare. 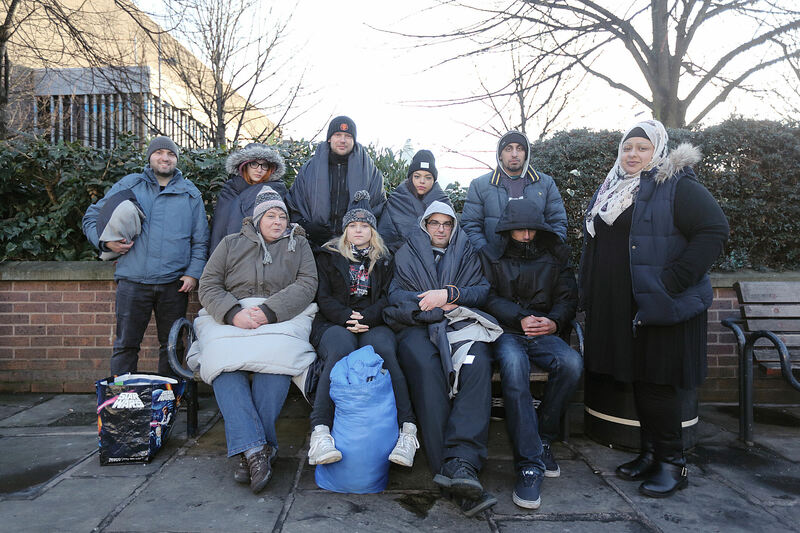 Which, for rough sleepers with no prospect, must seem interminable – the downward spiral is inevitable. As the clock struck 7am, the official end of the challenge, a mild euphoria kicked in, and a group hug, to congratulate each other and consolidate the camaraderie. Waving their good byes and looking to next Thursday when they continue their good work on the streets of Derby. They were all sponsored for the event, and they are always looking for funds to make sure that they can do their best for those who need their support. Derby City Council’s Budget con-trick. Where did the £70m go?